My aunt has an old fig tree clinging on for dear life in her tiny suntrap courtyard. It’s a gnarled, pretty ugly thing and it certainly doesn’t get any special treatment. But here’s the thing – it has immense character and never fails to produce a sumptuous gift of succulent figs every summer. I’m sure my aunt will be the first to admit she’s no gardener. But ironically, it’s this fact that has probably helped her fig to flourish! Figs don’t exactly thrive on neglect, but they don’t like to be fussed over either. Overly rich soil can lead to masses of leaf growth at the expense of fruits. A generous, clutter-free planting area will encourage far-reaching roots that only serve to promote even more rambunctious growth but still fewer fruits. Figs need reining in. If you can do that, then you too will be in line for a repeat performance of delicious fruits. The simplest way to grow figs is in containers. This naturally restricts root growth and also means that in temperate climates, where hard frosts can damage the embryonic fruits, it’s easy to move plants under cover for winter. 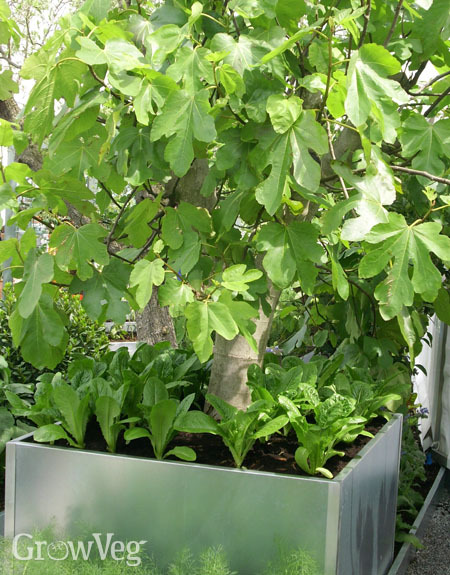 Figs are normally sold in containers anyhow, so planting them is just a matter of moving them up one container size, filling in the gaps with a soil-based potting mix that both supports and anchors young trees in place. It’s worth reinforcing, so forgive my insistence: figs really don’t need lots of room at the roots. So move them on to the next size of container no more frequently than once every two years. Avoid the temptation to ‘swamp’ rootballs in over-sized containers. Grow figs in full sunshine – a sunny patio or against a sun-drenched wall is ideal, especially as the fruits ripen. At the end of the season, once the leaves have dropped, lift or roll containers into a frost-free greenhouse or shed until spring. Figs look stunning planted against a sunny wall where they may be trained into luxuriant-looking fans. To restrict root growth in this instance you’ll need to use a ‘planting pit’. To make one, dig out a square hole 60cm (2ft) deep and wide then line the walls with vertical slabs, leaving about 3cm (1in) poking up above ground level. Now fill the base of the hole with 20cm (8in) of compacted rubble, stones or bricks. Roots will have a hard time breaking free from that, but should still enjoy good drainage courtesy of all that rubble. Planting pits should be made at least 20cm (8in) away from the base of the wall so roots are clear of any rain shadow. To plant, use the excavated soil, enriched with some well-rotted organic matter such as compost to help plants establish in the first instance. You could also use a soil-based potting mix. Regularly spaced horizontal wires, every 30cm (1ft) or so, will offer support for the young branches to be tied to. Prune figs in early spring then again in early summer. The first pruning is to remove any unwanted growth, dead stems or generally weak branches. Then in early summer new growth is pinched out to encourage bushier growth and, for wall-trained trees, a fuller fan shape. Right at the start of the season, a general-purpose organic fertilizer is a welcome way to wake trees back up, with an additional blanket of well-rotted compost or manure laid around ground-grown plants for good measure. Plants need regular watering during the summer, particularly as the fruits start to swell and ripen. Apply a potassium-based liquid feed – tomato fertilizer is perfect – to give plants a boost during this period. In warm climates you may get as many as three crops of figs in any single year. Lucky you! For temperate-climate gardeners like me the best you can aspire to is one. Figs first form as tiny embryonic fruits. In cooler climates if these haven’t swollen and ripened by fall I’m afraid they’re not going to. Any figs left on the tree at this stage won’t cross the finishing line and will drop off at the first frost. It means that any figs larger than a pea should be removed before the end of fall. Those left on the tree will then overwinter to form next summer’s fruits. Figs served warm with yogurt and a drizzle of honey are irresistible! The trees themselves are reasonably hardy, but the fruits are not. For this reason you’ll need to protect outdoor figs from the worst of the frosts. Row cover fabric, or straw or bracken held in place by netting, should help to keep the young fruits safe. Remove this protection towards the end of spring as the trees burst back into life. Sunshine is crucial for successful ripening, which is why it’s best to reserve the sunniest corner of your garden for these warmth-loving fruits. They are ready to enjoy when the fully coloured fruits soften and point downwards. A tiny bead of nectar at the end of the fruit is your cue to get picking. The most decadent way I’ve found to indulge in figs is to warm them in the oven with a drizzle of honey before serving them on a cooling pillow of creamy, Greek-style yogurt with all that honey-juice goodness poured over the top. Garden-grown figs are absolutely divine – whether grown yourself or scrounged from a long-suffering auntie! "Very irrefutable Last behalf my gig tree grew, the other half was lacking leaves all summer,let's hope this year is better."